Many people dream of having their own business, but as with most dreams what we imagine can sometimes be far from the reality of things. Most businesses fail in the first five years of their existence and those that don’t often turn out to be a lot more work than the owner could ever have imagined. Instead of getting the freedom so many people dream of, many business owners find themselves so caught up to their business venture they have less freedom than ever. Of course, there is a way of doing the transition from employer to employee that really works though - read on to find out how. Would You Be a Great Employer? Are you a natural leader? Are your people skills above and beyond? Can you handle working under stress? Are you organized? Prepared to work long hours? Great at problem solving? Good at inspiring people to craft what you want them to craft? Have a read through various articles online that discuss what it is like being an entrepreneur and the skill set you need to possess. Then decide what skills you have and what skills you lack. Either develop the skills you lack or build a team around you that has those skills. Just because you have an idea for a business doesn’t mean you have to run the entire business yourself. In fact, you probably shouldn’t. The last thing you want to do is invest time and energy in a venture that will never take off, so ensure your idea is worth pursuing before you actually pursue it. How can you do that? First, do your market research - is there a market for the product(s) and/or service(s) you have in mind? Whilst it’s a good idea to start asking friends and family as they will probably have some insight, they should not be the ones to tell you whether there is a market or not. Especially if they are not the target market. Asking someone who does not drink coffee if your new coffee shop concept is worth pursuing is not the best of ideas, unless they are extremely business savvy and can look upon your idea without being influenced by their own preferences. You can also use a product development company who can review your idea (if you are developing a product as opposed to a service), or ask business insiders what they think. You will also have to do some market research where you check things like the saturation of the market. If you intend to set up a coffee shop and there are already ten other shops in the same neighborhood the market might already be saturated, depending on how different your concept is from what is already out there. To know your business is worth it you don’t just need to check that there is a market, but also how much money you can earn from selling your products and/or services to that market. Some products cost more to produce than what you could sell them for and therefore wouldn’t be viable in the market place. Create a business model or get help from someone else to create one to ensure your idea is a viable one financially. Also, you need this to figure out how much money you need to invest to make it happen. 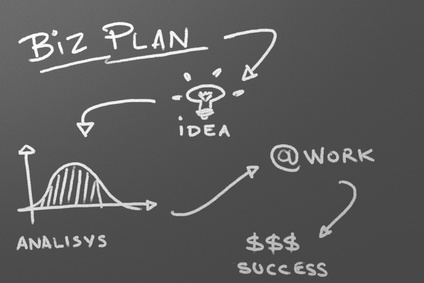 There are several online software tools and services that can help you write your business plan. Liveplan for example offers a great online service. If you really feel you aren’t apt fro writing it yourself, hire someone who can do it for you. Make sure to include a great marketing plan and, again, seek advice if it isn’t your forte. Having a great product or service is amazing, but if no one knows about it, it won’t sell. Try out Kickstarter to sell products before you launch, or attend a trade show where you test how well your product is received. Alternatively, put up a website and do a soft launch where you offer the product (and market it) to see how many people are willing to pay for it (when they are about to fill in their credit card details inform them that the product is out of stock/not available yet and that you will notify them when it is available). There is, after all, a difference between people thinking you have a great product and people willing to pay for it. There are plenty of courses out there that can help you build leadership skills, as well as business skills. It has been said that life is a lot about being prepared for the opportunities that present themselves and it is no different in business. The better prepared you are, the greater your chances for success. Contact organizations that provide free information for small business owners, or organizations that offer training for entrepreneurs and people wanting to launch a business. Michael E. Gerber in his famous book The E-myth talks about a lot of entrepreneurs ending up frustrated after launching a business as all they ever do is work instead of having the freedom they so desired. His answer to this problem is to ensure you create systems that enable other people to run your business if you are not there. This also enables you to one day sell your business. Becoming an employer is difficult and the best way to ensure you make the transition successfully is to educate yourself as much as possible, test that your idea for a business is a viable one and prepare the business by writing a great executional plan, which you then proceed to execute. Get the support you need and build a team around you that can help you with what you don’t know.